Pediatric Neurology Briefs is a peer-reviewed, Open Access, journal designed to expedite and facilitate the review of current scientific research and advances in child neurology and related subjects. The Contributing Editors provide detailed summaries of published articles, followed by commentaries based on their experience and corroborated by appropriate supplementary citations. Pediatric Neurology Briefs, a continuous review of the current literature, has been published without interruption for more than 25 years. The journal was originally launched in London, England, in 1987 while the founding editor was on sabbatical as honorary consultant at Great Ormond Street Hospital. The editorial department is now based in Chicago, Illinois. Beginning in 2012, Pediatric Neurology Briefs is a Publishing Partner with both the World Health Organization's HINARI Program and EIFL. These services provide equitable online access to the major journals in biomedical sciences for eligible not-for-profit health institutions and libraries. PNB is now available through HINARI and EIFL in more than 100 developing countries, benefiting many thousands of health workers and researchers, and in turn, contributing to improve world health. 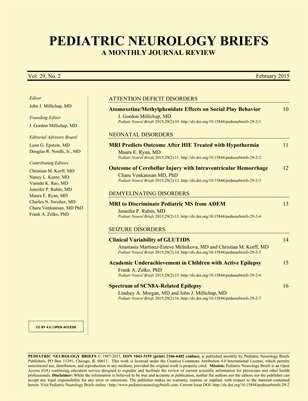 In 2015, Pediatric Neurology Briefs was relaunched as an open access (OA) journal with an expanded editorial board. The specialty of Pediatric Neurology bridges not only pediatrics and neurology but also neuropsychology, neurophysiology and epilepsy, neurosurgery and other related disciplines. Journals of various specialties are researched monthly for the selection of articles included in Pediatric Neurology Briefs. Pediatric Neurology Briefs has reviewed and referenced over 200 journals since inception. An edited selection of journals reviewed or referenced in the 2011 issues of PNB are listed below in order of frequency. Pediatric Neurology Briefs covers a comprehensive group of subject areas related to progress in pediatric neurology. An edited selection of these topics is provided below. The journal is published online as a continuous volume throughout the year. Articles are made available as soon as they are ready. The journal’s publisher, Pediatric NeurologyBriefs Publishers, focuses on making content discoverable and accessible through indexing services. Content is also archived around the world to ensure long-term availability. PubMed, Pubmed Central (PMC), EBSCOHost, Google Scholar, Academic Search, NLM, ScienceCentral, HINARI, EIFL, Paperity, WorldCat and Directory of Open Access Journals (DOAJ). PNB is listed with SHERPA RoMEO and CrossRef. If the journal is not indexed by your preferred service, please let us know by email or alternatively by making an indexing request directly with the service. We encourage research librarians to list this journal among their library's electronic journal holdings. Librarians, please find full indexing information here. A digital repository at the editors' home academic institution (DigitalHub) will retain archive copies of article JATS 1.0 XML and PDF files for preservation. In addition, the journal full text is archived at Pubmed Central and ScienceCentral. PNB uses Open Journal Systems publishing platform which is able to utilize the LOCKSS archiving systems to create permanent archives for the purposes of preservation and restoration. LOCKSS system has permission to collect, preserve, and serve this Archival Unit (Publisher Manifest). PNB is available for harvesting via OAI-PMH and is a registered data provider with the Open Archives Initiative, WorldCat Digital Gateway, and BASE. Pediatric Neurology Briefs Publishers, the journal’s publisher, recognises its responsibility as a guardian of the scholarly record and takes an active role in establishing standards and policies in publication ethics. The Editors have committed to maintaining high editorial standards through rigorous peer review and strict ethical policies. The Editors follow the "Code of Conduct and Best Practice Guidelines for Journal Editors" published by Committee on Publication Ethics (COPE). Editorial process regarding issues of publication ethics and publication malpractice will follow the ICJME Recommendations for the Conduct, Reporting, Editing, and Publication of Scholarly work in Medical Journals. All Pediatric Neurology Briefs content is now Open Access. You can print as many copies as you would like for free (CC BY 4.0). Digital Edition (ISSN 2166-6482) subscriptions are available by joining our mailing list to be notified when new volumes are published online. The Print Edition (ISSN 1043-3155) is available as single volumes only (single issues pre-2018). To 'subscribe,' please join our mailing list to be notified when a new, single issue is published here. Reprints of back issues are also available. The print-on-demand HP MagCloud service is for readers and authors who would like professionally-produced single issues and reprints. Prices listed cover the cost of printing only with additional fees for shipping worldwide.